Description: This brand was formulated and sold for a number of years during the 1830’s and 1840’s by Dr. Henry Boyce of Roxbury, Vt. It is believed that the brand name was first embossed on a bottle during the late 1850’s by Francis Fenn, a druggist in Rutland, Vermont. A variant made about 1864 has Fenn’s name on it as proprietor. He sold the brand to William Henry about 1867 in order to expand the retail business and evidently got out of the wholesale drug trade. 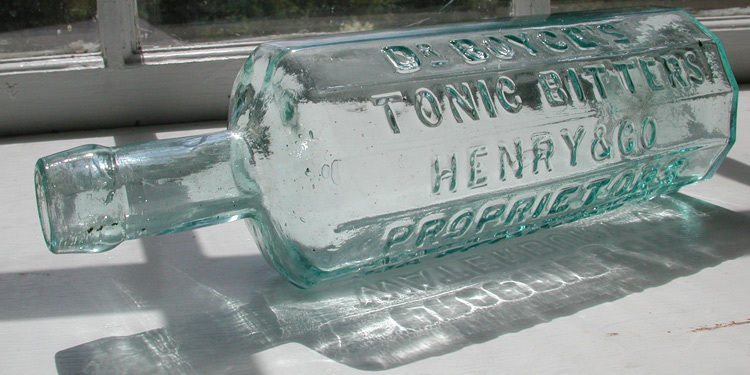 Henry and Company formed in Waterbury, Vermont in 1868 (Compliments of Bill and Betty Wilson – 19th Century in Glass). Condition: Excellent, strong embossing, sparkling, tooled tapered collar.